Back in September, this map was brought up in three different instances around the same time. First was during a little writing workshop that was part of the Billboard Poetry Project. Next was in my Intro to Literary Theory class. The third was during my History of Creativity class. Seriously. It was all within the same week. What are the chances? 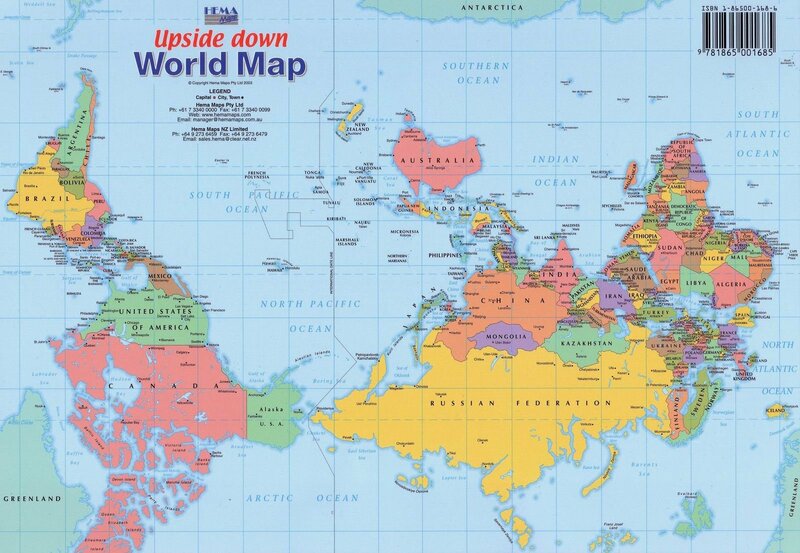 But in each instance, the instructor showed this map to prove the point that there are many different perspectives. Who came up with the up and down, right and left of the map? (That's a rhetorical question. Don't answer it. It's not the point.) The world is round. Every way is up. And every way is down (that's where the enemy gate is) and so on. But, at least as Americans (and other northern hemisphere-ites) we are used to seeing the U. S. of A. on top. And in the upper left (and that's how we read, too, ever think of that? Though in some other countries words are read in different directions). Anyway, we're used to our normal way of seeing things. The unmistakable change shown in the map above is unsettling isn't it? But to someone in the world (lot's of someones actually, like everybody in Australia) this map is not upside down at all. So detailed and beautiful, right? (Yes, I am being facetious. But I'm also leading you on.) But it is detailed and beautiful. If you look closely you'll see my husband with his hat on, holding our little girl-baby. Next to them is the apple tree in our apartment parking lot, with several little apples on it. At other places on the map, you can find a shirt, a skirt, a book with pretend writing in it, a block of cheese, a head of lettuce, and a gallon of milk. There are also a couple of lovey-hearts (with my family and the library). That's pretty detailed, if you ask me. But there's so much blank space! Where is the rest of Provo?! It's not that I don't think it exists, it isn't shown because I drew the things that are important to me and that are common to me. My home is my center, I am a student, but that's not where I spend most of my time, and unfortunately for my grades, that's not my focus. You'll notice too, that the sidewalk route I commonly walk is colored in, and the only roads shown are to the places I've marked. You can see that the Provo City Library is a major landmark for me. That's a given, right? And on the upper left? That's Chao's the little Asian market down on the Avenue. It's a really neat place, you should go sometimes (get the Vermont curry cubes, mild, and then go on over to Smith's for some baby carrots, a few potatoes, a boneless, skinless chicken breast, and an onion). And yes, as you can see, I think D. I. (Deseret industries Thrift Shop) is the place to get clothes. I'm not ashamed (I like to think I'm smart for it). Anyway, do you get the picture? The point? Perspective. Opinion. What is held dear. 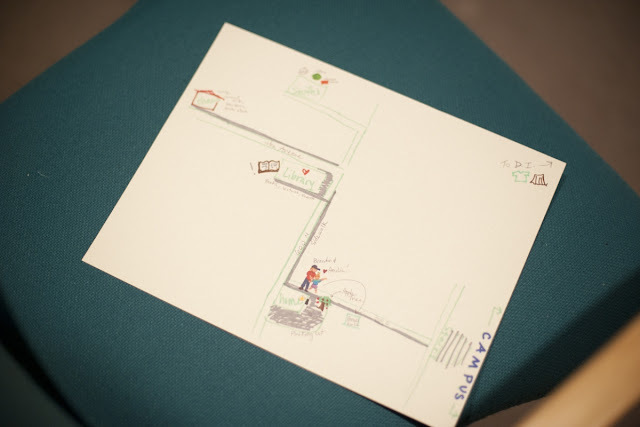 In the story you are writing, how would your main character draw a map of their surroundings? What would they include? What landmarks? Would they show any animals or people? (I forgot to draw my cat.) What is important to them? Now think about your secondary characters, or especially think about your antagonist if you have one. In what ways would their map be different from the protagonist's even though the map is of the same area? What would they include? What is important to them? Or what is common? One more thing I'd like to point out about my lovely map. There is an arrow drawn from my little daughter to a nearby square. That square says "Renee's House". Whenever my Wee One and I go for a walk along the sidewalk, past the very significant apple tree (she always wants an apple so I pick her one), she makes a b-line for that house and climbs up the steps to the front door. That is where another little baby from our ward (church group) lives. That house is on my map because it is meaningful to my daughter. Same with the apple tree. And my daughter is uber-meaningful to me. Is there anyone very important to your main character or antagonist? So important that what that character cares about, becomes something your main character or antagonist cares about? Focus on the details that show why your main character is important (and your antagonist too if you have one). What does that character focus on? What does that lead the reader to focus on? Write from your own chair. Don't try to sit in someone else's (another writer's) chair. How you see your surroundings and process details is important. This reminds me of a book Tim read about writing called maps of the imagination. He liked it; it explores similar questions I think! Cool, I'll look it up!